The 1964 Tokyo Olympics were not the only news on October 13 and 14. 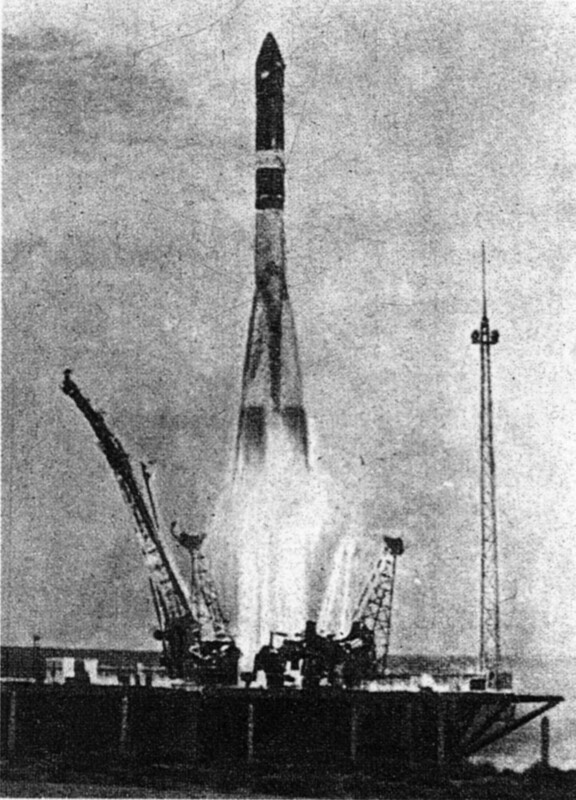 The Soviet Union’s rocket, The Voskhod, orbited the earth 15 times from October 12-13 – the first spaceship to send more than one person into space. In a recorded conversation between Soviet premier Nikita Khrushchev and mission commander, Valdimir Komarov, Khrushchev swelled with pride, while Komarov spoke with modest confidence of the need to complete the mission. KHRUSHCHEV: I could hear you wonderfully, absolutely wonderfully. Well, I wish you, dear comrades and friends, good luck in the cosmos. The most important wish is for a happy landing on earth. COLONEL KOMAROV: Thank you very much, Nikita Sergeievich, we could hear you excellently as if we are talking in Moscow on a normal telephone. We understood you. Everything is in order here. KHRUSHCHEV: I could hear you quite well. Just as everything is in order at this very minute I hope everything is in order at this very last minute of your flight. The people here are triumphantly excited and are proud of you. We are waiting here for you on earth. Good-by. Were the Soviet leaders and cosmonauts lying about how clearly they heard each other? Were the reports by “Western observers” an exaggeration? Who knows. Cold War trash talking was de rigeur in the sixties. It now seems certain the Russians will get to the moon before the Americans….the (Soviet) crew….will probably knew enough about the behavior of the human body in a weightless condition (and perhaps also in an artificial atmosphere containing helium instead of nitrogen) to predict something approaching certainty a date when prolonged space travel will be feasible. All men in all countries will accept the Russian’s achievements for what they are – a triumph not just for Communists but for questing mankind. Another third party agreed that the Soviets may have taken the lead in the space race, but they added concern with the competition. The only nation to be devastated by the most technologically advanced weaponry of its time, the atomic bomb, the editors of The Japan Times explained in an October 14 opinion piece that continued technological one-upmanship between the two superpowers could eventually lead to wars among the stars. Among the objectives of the Voskhod’s flight mentioned by Tass is the carrying out of an extended medico-biological research in the conditions of a long flight. We may perhaps take it for granted that Soviet Russia has by no means given up the idea of placing a man on the moon. Recently, this has been regarded as an American ambition rather than a Soviet one, and it may be that the Russians are more eager to place in orbit around the earth a space laboratory or even an orbital military station. We must wait the denouement – which may not be long in coming. It is a sad reflection that in an age in which mankind has achieved the capacity to investigate outer space that we should have to think of the possible military use of the capabilities which are now being constantly added to, but we must accept the grim facts of our situation. There are still serious tensions on earth, and if these should ever burst into conflict we may be sure an effort would be made to use outer space for military purposes. While this possibility exits, the two great nations – the United States and Soviet Russia – feel the need to watch closely each other’s progress in space, if for no other reason. The Americans and Soviets did not need added incentive to beat each other at the 1964 Tokyo Olympics. And yet, the achievements of the Voskhod probably put a little spring into the steps of the Russians. At least for a few days. Only three days after the Voskhod successfully landed, leader of the Soviet Union, Nikita Khrushchev, the man who famously said to the United States “We will bury you,” was unexpectedly removed from power. A clip from the film, The Right Stuff: a glimpse of the American sense of urgency in the space race of the 1960s. Posted in Geo-politics, Olympics, Technology, Tokyo 1964 and tagged 1964 Tokyo Olympics, Konstantin Feoktistov, Nikita Khrushchev, Vladimir Komarov, Voskhod. Bookmark the permalink.